D23’s upcoming Destination D: Attraction Rewind event at Walt Disney World just became even more enticing, bringing big names to host big presentations for Disney fans. Huffington Post reveals Legendary Disney Imagineer Tony Baxter will also be presenting never used concepts for Discovery Bay, an area of Disneyland that would have been inspired by Jules Verne and H.G. Wells. 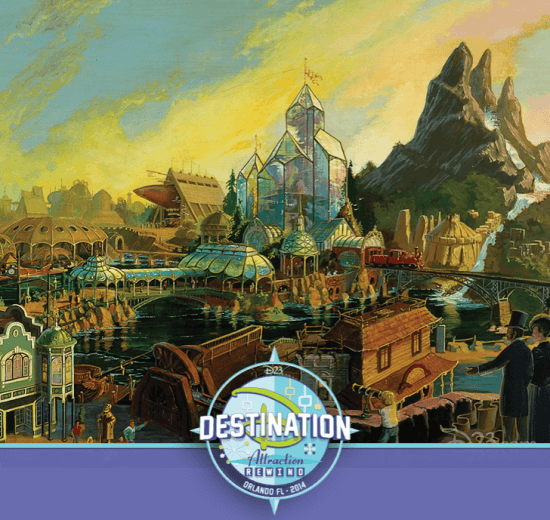 In addition to these presentations, Destination D: Attraction Rewind will dive deep into rides of the past, including Adventure Thru Inner Space, If You Had Wings, and 20,000 Leagues Under the Sea. And to cap the weekend off, Pleasure Island favorites will be resurrected, including the beloved Adventurers Club. The event takes place at Disney’s Contemporary Resort on November 22 and 23. Tickets are available via the D23 web site. I’ve read things in the past about Discovery Bay and think something like this being added to Disneyland would be perfect, especially with parts of it reflecting San Francisco. Why not mix the steampunk feel of Jules Verne, alongside the San Francisco/Tokyo feel of Big Hero 6 and get something new and fresh? I know they are talking about Star Wars being added, and Hong Kong is getting the Pirateland, so why not do something in California.